In a survey conducted by the California Department of Boating and Waterways in 2011, more than 96 percent of boaters reported that oil leaks into the bilge or engine compartment most of the time or every time they use their boat. This oil is then pumped from the bilge and into waterways – polluting the water, damaging the environment and killing aquatic life. 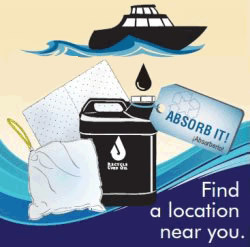 The Oil & Absorbent Pad Exchange Program (OAEP) now offers boaters a FREE absorbent pillow or sheet they can place in the bilge to absorb oil. Once the pillow or sheet is saturated, those participating marinas will safely and legally dispose of the oily pad and supply boaters with a new one. Participating in the OAEP is a safe, legal and convenient method for maritime boat owners to reduce oil pollution in local waterways. This program is for Marin County residents only. Businesses should continue to dispose of their hazardous waste at the hazardous waste facilities in San Rafael or Novato. This program is limited to absorbent pillows and/or sheets. Get more information on oil recycling. Visit our Recycling, Reuse & Disposal Guide to find more disposal options for many other everyday items.